It seems all too common to talk about a budget crisis in the United States of America. Most of the fiscal year 2011 was under debate and took much too long to be resolved. Now it is the government of the state of California that finds itself in a pickle. The state budget of California is just too much for the state to afford. In total, the government officials have determined that a total of $26.6 billion must be accounted for. The options appear to be to either cut jobs and departments and programs or to raise state taxes in order to secure the needed funds. Jerry Brown, the new governor of California who took over after Arnold Schwarzenegger, wanted to let the people of California vote on whether or not to extend a tax increase that has been affecting Californians since 2009. However, Republicans in the state did not let Brown let the matter go up for a vote in the upcoming June election. As a result, communication between Democrats and Republicans in the state has been strained. Governor Brown still wants the people to vote on the matter, but it is highly unlikely that it is going to happen. Instead he is going to have to present a proposal without their input. Odds are that he is not going to increase taxes on the people any time soon. Brown has promised that he will do all that he can to make sure that the budget is fair and balanced and won’t unfairly tax the people or hurt numerous programs. Earlier in the year, Brown was looking into making cuts to education, social service programs, and Medicaid. He was also going to bring in an extra twelve billion dollars via taxes. The tax revenue would come from extending a quarter percent rise in personal income tax and a one percent increase in sales tax. 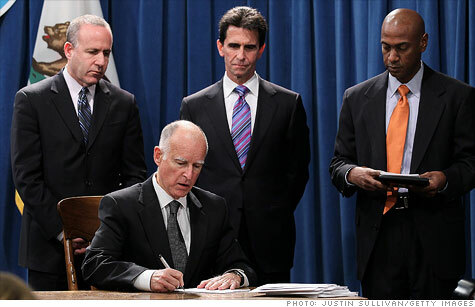 In March, the state government did agree to $14 billion worth of Brown’s plan. In total, state colleges lost $1.1 billion and Medi-Cal lost even more at $1.7 billion. The governor’s proposal is expected to be delivered on May 16th. In the coming days, Democrats and Republicans in the state are expected to be working feverishly on the details in the budget in order to avoid a long, drawn out battle like the one that was seen in Congress for the federal budget for fiscal year 2011.